The essay that appears in Creative Nonfiction is essentially the first chapter of my work-in-progress, The Saltwater Twin and Other Mythical Creatures. While I continue to work towards the goal of publishing a book, a chunk of my time each week has also been spent looking for online and print publications that might be good places to submit chapters and excerpts of chapters. I was initially somewhat frantic about this task and the hours it took away from The Writing of the Book, but it’s actually been a pretty significant learning opportunity – I’m a better writer for it. As a rookie essayist, reading other authors in the genre is, of course, essential. I’ve learned the nuts and bolts of drafting cover letters and formatting manuscripts for submission. The task of excerpting longer chapters has taught me to identify a narrative thread and given me practice in determining what sections of a piece tell the story (or stories) and the myriad ways that story can be told. Last month, I got an email from editor Hattie Fletcher saying CNF would like to publish “The Saltwater Twin” in their summer issue. (It was a good week. I also found out my post “On Writers, Egos and Truth” had been Freshly Pressed!) A few days later Hattie emailed a copy of the essay with her comments and suggested changes. The biggest one was a concern she had about the final paragraph which she felt read like the prologue to a longer work – which it kind of was. “The Saltwater Twin” was conceived of as the first chapter of my book. We chatted on the phone about that big change and some of the smaller ones. I emailed her my edits later that afternoon. I’m very happy with the new last paragraph; in fact, I don’t know which I’ll ultimately decide to use in the book. Then I signed a contract, wrote a bite-sized bio, and after one more round of tweaks by the copy editor, that was that. 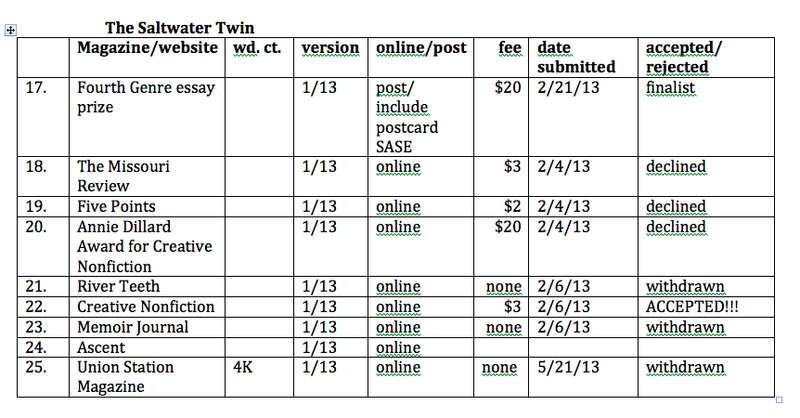 I first sent “The Saltwater Twin” out almost a year ago – in September 2012. At first, I wrote “rejected” when a magazine turned it down, but I switched to “declined.” Wussy, perhaps, but I find it less discouraging. Those numbers, for your scorecards, are 16 drafts, 11 months, 25 publications. It’s very satisfying to know that all that work bore fruit. 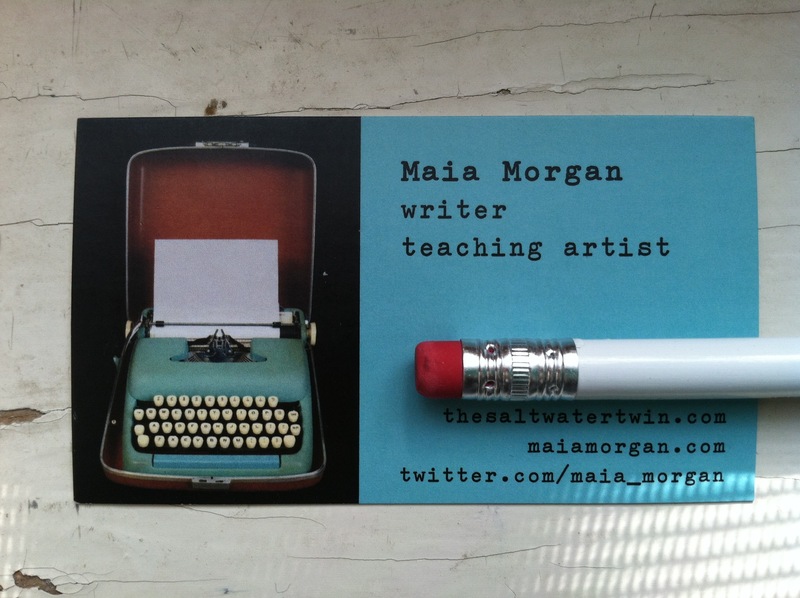 Also, I now have business cards. Fancy, no? Good for you, on all counts! Your business card looks fantastic. I have e-published two novels (after working with two different literary agents over several years), and probably spend nearly the same amount of time “marketing” them as I do on writing the new, third book. It goes on. Thanks for taking us on the journey – you are an inspiration to me ! Nice. I like your list of acceptance and rejection. I am too lazy to do that, but I should. I soon realized that if I didn’t keep track, I’d forget where and what I’d sent out into the world! I know. It’s very basic record-keeping. You make it so attractive, just like your business card. You remind me of a cupcake. Delighted! I have a copy ordered! Keep on truckin’ lady! OOPS! P.S. Love the business card. Congratulations! I’m so excited! I ordered my copy immediately and will share it with my mom who is your biggest fan (next to me). Love the business card too!!! Oh, thank you so much Tekki! Love to you and your mom. Congrats!!!! I just bought my copy and can’t wait to read it. Thanks, Heather! And what a great quote. Thank you for sharing. Thanks, Larry! You heard it first. Congratulations! I really relate to what you’ve written, your sending out bits of your WIP to literary journals, but it taking away time from “The Writing of the Book” as you aptly put it. I’ve been doing the same thing with some chapters from my novel, tweaking them so they can stand on their own. I’ve had one published that way too. But I think like you that while a diversion, it has its own merits in practicing the writing/editing process, learning to grow a thicker skin, learning more about the literary market, and giving me needed encouragement to keep pressing on with my book. I too have a submission table that looks almost identical to yours! I’m going to switch to “decline” rather than “rejected” now too. Thanks for sharing your experience. And good luck with your novel! Very interesting to get the “behind the scenes” look. I have always wondered how these different essays find their way into CNF. This gives me encouragement to keep writing and submitting. I’m not working on a book, but have a lot of in-progress shorter pieces that could really use polishing up so they can hopefully see the light of day at some point. Oh, and P.S. I enjoyed the essay! Thanks, Louise! I’m glad you found the description of my process encouraging. It’s more marathon than sprint, that’s for sure!